Comfortable & Spacious First Level apartment in a private house. • Located in Jackson Heights/historical district - Queens, NY. • Accommodates 4 guests comfortably. • Within blocks to restaurants, farmers' markets, nightlife, parks, & transit. Your pleasant experience in this city is important. As your host, I will be available via phone/email if you have any questions or concerns, or in need of a local recommendation. Jackson Heights is one of the most diverse neighborhoods in the New York City borough of Queens. It is a historical district with a plethora of different cultures and cuisine. Transportation to Manhattan (Grand Central) is a 20-minute train ride. The location is very convenient. Located within blocks to restaurants, farmers' markets, nightlife, parks, & transit. Easy access to major Subway lines, Buses, Highways, & Airports. We had a great stay! The apt is exactly what we needed. Nice neighborhood, close to stores, restaurants and train station. 20-30 minute train ride to Manhattan. George and George checked us in and gave us all the info we needed, they were terrific. The location is great. The property is super clean and spacious. This is my first Homeaway experience. The property is well maintained, clean, in a quiet residential area yet, just minutes away from shopping and eatery. I didn't have the opportunity to use the clean kitchen but everything is there if I needed to cook a meal. Most of all, the shower is always hot! Thank you, George, for providing a home away from home. Perfect place to stay in all ways! My husband and I were very happy with this property. George, the host, was very friendly, attentive, and communicated promptly with us. The apartment was clean, spacious, and comfortable. It was located close to subway access and NYC, yet far enough away to be in a quiet neighborhood. It was about a 20 minute subway ride to Manhattan. I highly recommend this place. I hope it is available on our next visit to New York. It is definitely 5 stars! second time at this property! stayed last year with 1 Grandson...this time I brought my son, daughter in law and 11 year old Grandson...Property is immaculate and convenient to the #7 train into the city. George and his Father are gracious hosts and they bend over backwards to accomodate the needs of their guests...I would recommend this property to anyone planning a trip to NYC!!! 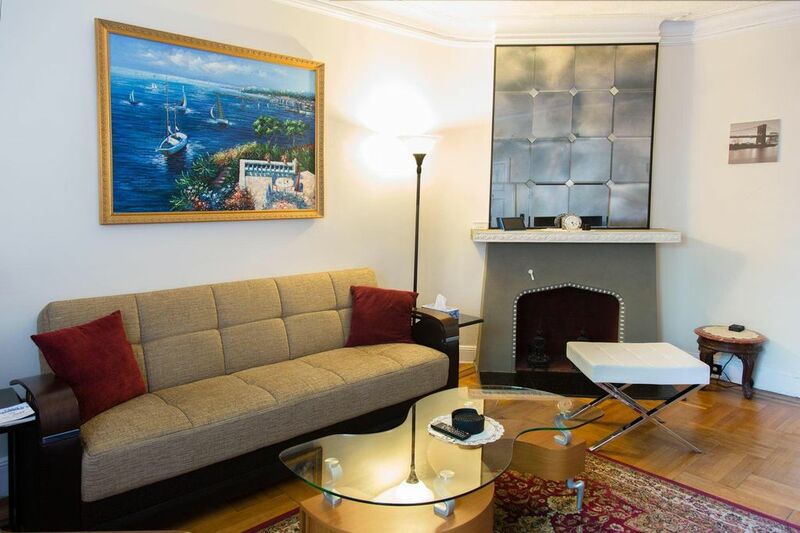 Spacious and modern apartment within walking distance to the subway and tons of restaurants. The hosts were so kind and communicative. Would definitely stay here again. • There is a one-time cleaning fee of $80. If you're staying longer than a week, then it will be a once-per-week charge.